This is where I try to compare old photos of Cornwall with how the scene looks now. 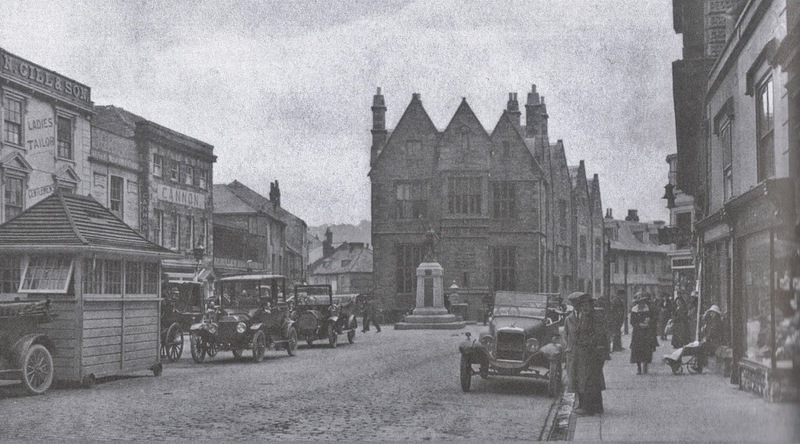 Today I was in Truro with a 1920s picture (above) of Boscawen Street. I couldn't seem to get into the exact same position, from where to take the photo today (below), but the similarities are there. The street still has the same cobbled surface and some of the original buildings. It wasn't a particularly pleasant day weather-wise for our visit as it had been raining and there were dark rain clouds in the sky. We still had a take-a-way lunch sitting outside in the square: Cornish pasty (of course) though mine was the vegetarian version. But eating outside can be dangerous! There are scavengers about, wherever you look. Though Truro is about nine miles from the coast the seagulls are ready to pounce. Two people sitting near us felt the consequences. A man eating a sandwich had it snatched from him and a poor little girl lost her sausage roll to a diving seagull and was in floods of tears. Even the naked drummer man had to watch his credentials. We wandered up to Victoria Park and the old bandstand. But even there, the seagulls were hovering. Perhaps this is how Daphne Du Maurier got her inspiration for The Birds, as she lived in Cornwall. Back to Cornwall. Glad to hear the drummers credentials were kept safe. Always like your Cornish posts, doesn't look like too much has changed in Truro. Luckily the city has kept many of it's old buildings. Funny! A seagull coming second in a horse race! You are right the tourists like to feed them. That's sad about your town, but sadly that happens a lot and in England. So much is unchanged! Love the photos, old and new. I laughed about the gulls! Quite brazen! Very brazen, I think they've forgotten how to live by any other means. I like these posts where you show the old and the new. I've seen a post on the town of Mullumbimby where the blogger takes an old photo to the spot it was taken in the town and tries to match the photo to the current setting and takes a photo of both.It looks quite good,too. Just copy and paste the link into your browser to go to the site.